Have your kids requested a Pikachu cake for their birthday? 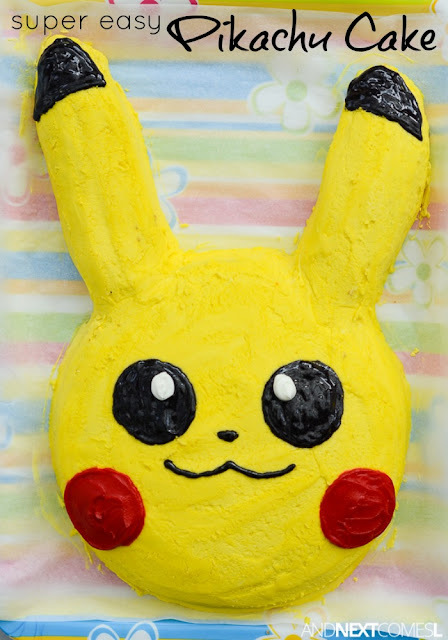 Here's how to make a Pikachu cake. I promise it's super easy! I am not much of a birthday person. However, one thing that I will do every year for my kids' birthdays is make them a fancy cake. I may not throw them an incredible party, but I always make them a fun cake at their request. They pick the design and I make it. I am not a professional baker, at all. It's just something that I choose to do for my kids' birthdays. It's fun and the kids adore the finished results! And I get to eat copious amounts of icing and cake scraps once per year, without feeling guilty. The cakes that I have made over the years have varied. There's been cats, monkeys, 3D bears, 3D pirate ships, math cakes...so many fun ones! I, however, outdid myself this year. J requested a Pikachu cake for his seventh birthday, like one does when obsessed with all things Pokemon. And it was one of the easiest cakes that I have made in a long time! Here's how to make a Pikachu cake. I promise, it's super easy. 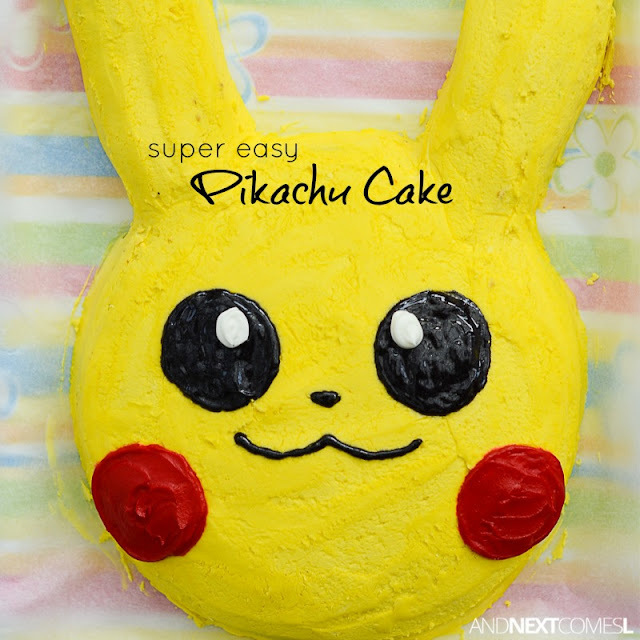 Are you ready for the easy Pikachu cake tutorial? 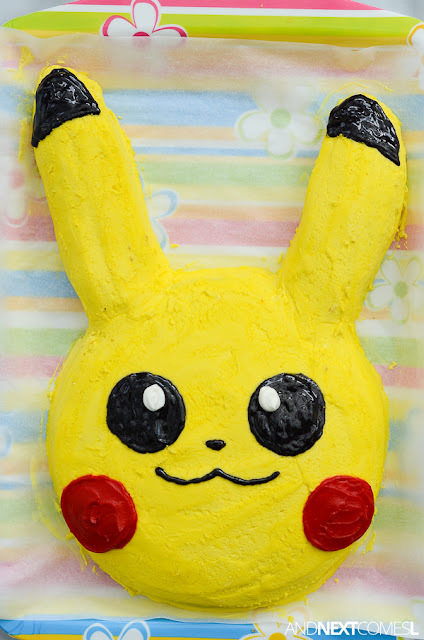 I know that a Pikachu cake tutorial is a little random for my blog. But, considering I take photos of these cakes every year and share them on my personal Facebook profile, I thought maybe others would be interested in my cake making adventures as well. 1. After the cakes have cooled, place one round cake on the tray that you will be serving the cake on. 2. Cut two rabbit-ear shaped pieces from the other round cake. Optional: eat cake scraps. 3. Place the rabbit-ear shaped cake pieces at the top of the round cake to form the basic shape of Pikachu. 4. Make your icing (skip if using store bought). Save a small amount of white icing (roughly one tablespoon or so) in a separate container. You will use this small batch of icing for finishing details. 5. Add some drops of yellow food coloring to your icing and mix until the color is evenly distributed. 6. Add a generous layer of yellow icing to the entire shape of the cake and along all edges. 7. Chill the cake in the fridge for about 20 minutes. 8. Add an additional layer of yellow icing if needed. Otherwise, run a butter knife or cake knife over the entire cake to smooth the icing as best as you can. Optional: lick the icing off the knife to reward yourself for such an amazing job! You deserve it! 9. Add black and red details using the decorating icing tubes. 10. Using a piping bag (or use a small plastic zipper seal bag and snip one corner) to add the white dots to the eyes using the icing you put aside in step four. I made this today for my son and it was perfect! Thanks for sharing! I also made the cake and my grandson loved it. Thanks for an easy and cute idea. This is the best gift a mother can give to her child. I will soon be organizing a birthday party for my daughter at one of the biggest event venues Chicago and I will try my best to make a cake for her with the help of your recipe.